For a business that depends on an internet connection for business operation a single link can be a "single point of failure". Even multiple lines can be a risk as quite often they will converge at the local exchange. A second link via satellite broadband will "always" be available. For this Business Continuity service the bandwidth would be charged only in the months when it is used thus providing a cost effective solution. For some businesses an internet connection is required within a short space of time. For example a construction company might take on a new project and need engineers on site from day one. However, there may be a delay of anything from 30 to 90 days for the telecoms provider to install a line. In this situation a satellite system can be deployed in days and users can access applications etc. When the telecoms line has been installed the satellite can be moved to the next new site or kept in place for resilience. Housing Associations, like many other organisations, are faced with the dilemma of how to cut costs while maintaining customer service. One approach to this is to close offices in small estates and replace them with a mobile office that visits each estate on a regular basis. 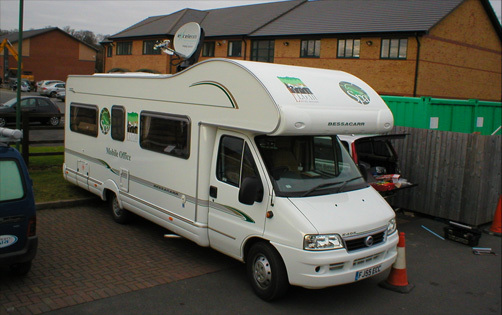 If the mobile office is also fitted with satellite broadband then users can maintain access to Head Office applications. POINT systems have successfully deployed a number of these vehicles. For this to be accomplished a high speed internet access is required at "all" locations. The service needs to be deployed quickly as often the vehicle only stops for a limited time and the system must be easy to use. Local authorities often use vehicles to bring adult learning and IT services into the heart of the community. Mobile satellite broadband provides the ideal solution for high-speed, reliable internet access in any location, enabling users to have a wealth of information at their fingertips. POINT systems have worked with a major utility company in both of the above areas.